back to cadillac row at the ruby's show in whittier. always at the back corner, i suppose because they're such big cars. these guys always park in bunches, but here in typical guy fashion, every other space, just like in a movie theatre. 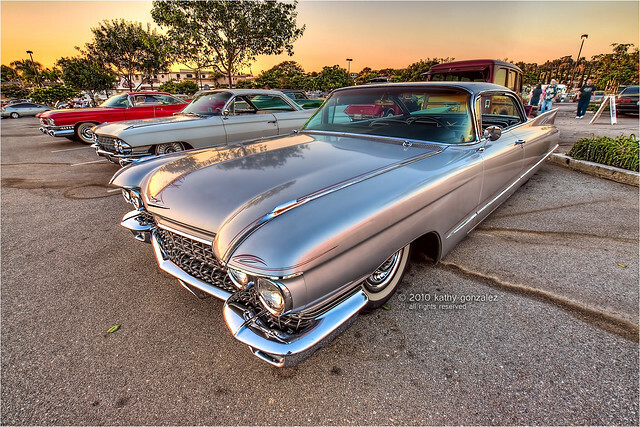 i've shot this front caddy before, but didn't really like the result here. always figure if i take a car i like enough times, eventually i get something better. just gotta catch it with the perfect light, angle, location, etcetera, etcetera, etcetera. speaking of location, while i was out this wet, rainy weekend, i kept driving by a nice '48 chevy in my hood, just parked out on the curb. finally went out when the rain took a break, camera and tripod at the ready. the car was just lovely, with fallen leaves all around it, ivy behind, rain puddled and reflecting the car in the misty light. i parked across the street, and just sat there. couldn't work up the nerve to get out and run across the street. best shot would have been from the street side, but then i would have been road kill if i took too long. other side wasn't as interesting, and since i'm not sure where the owner lives or who he was, just started imagining being chased down the street with a baseball bat, and so i drove away. was gone this morning...why didn't i follow my own advice and take it when i see it?